Keeping your chisels sharp is an important part of superior woodworking. Blunt tools will not give you the professional finish that all craftsman should strive for. 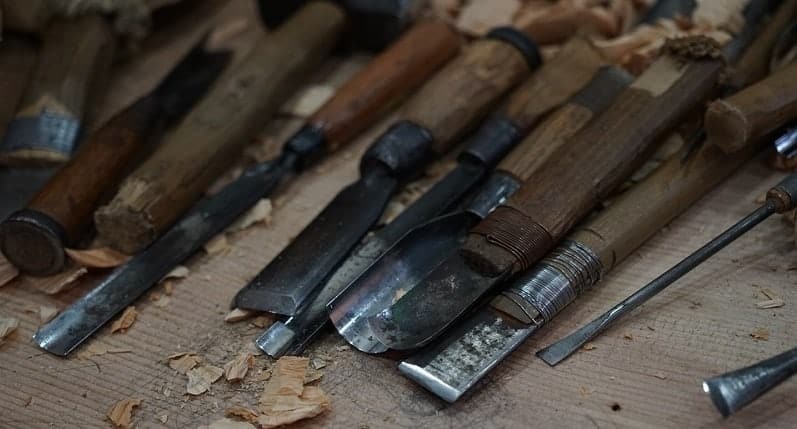 However, sharpening your tools is often one of those tasks that it is easy to leave on the backburner. We’ve all been guilty of falling into the ‘I’ll take care of that later’, trap. One of the reasons this happens is because sharpening your chisels can feel like a chore. By the end of this short guide you will be able to follow 5 simple steps to quickly finishing the job. 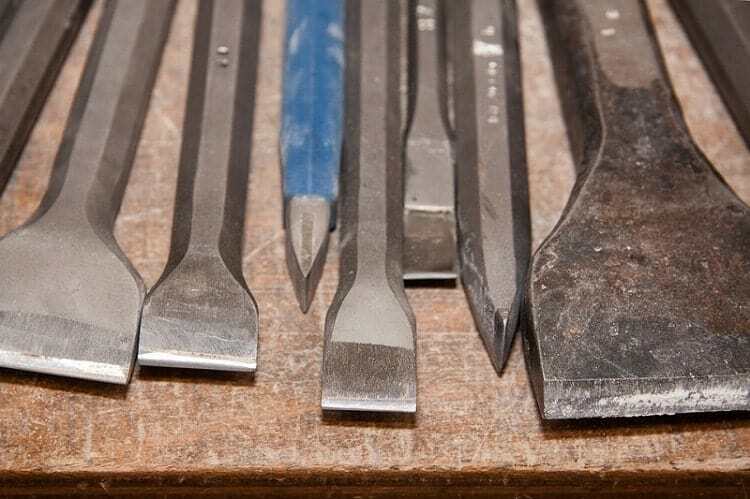 In part one of this chisel sharpening guide we will look at how you can get your tools into tip-top condition by using a sharpening stone. Most chisels leave the factory with a 25 degree edge. If you wish to maintain that angle while sharpening, you will already have the existing edge to use as a guide. 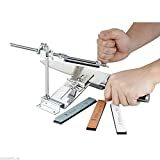 However, should you wish to sharpen the edge to an alternative angle you may want to use a sharpening system that will hold the chisel in the correct position for sharpening. When inserting your chisel into the honing guide it is important that you don’t over-tighten the fixing screws. You will want a small degree of play, so that you can move the end of the blade into position at the desired angle. Once the bevel is set to the correct angle in line with your sharpening guide, you can fully tighten the fixing screws and move onto step 2. Apply the relevant lubrication (oil or water) and ensure you have enough on standby to continue adding as you work. If you have a dual sided stone, use the heavy grit side first. (If you are using two separate stones, again the chisel should be worked on the heaviest grit). With the chisel set firmly in the honing guide as instructed in step 1, begin to firmly move the chisel across the entire length of the stone in a repeated, slow and steady manner. As you sharpen the bevel you need to keep the rollers of the honing guide in clean contact with the stone. This will ensure that you are repairing the edge of the chisel in line with the angle you set in step. After repeated passes across the heavy grit side of the stone, you will have ground the chisel to the required angle. Now it’s time to fine-tune that finish using the fine grit stone. Flip over or replace you sharpening stone and repeat the process, (add oil or water as required). This will ensure that your chisel bevel has a sharp and clean edge ready for work. Once you are happy, remove the chisel from the honing guide and remove any burrs using a piece of scrap wood. 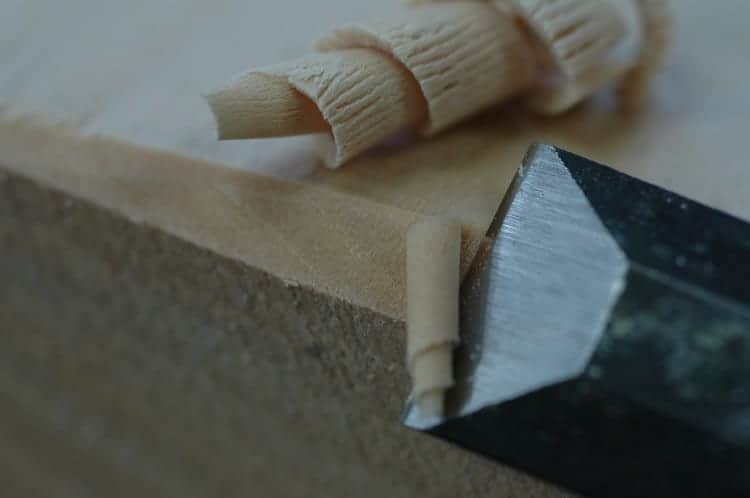 This final step will ensure that the underside of your chisel is flat. This is important as it will help keep your edge sharper for longer. 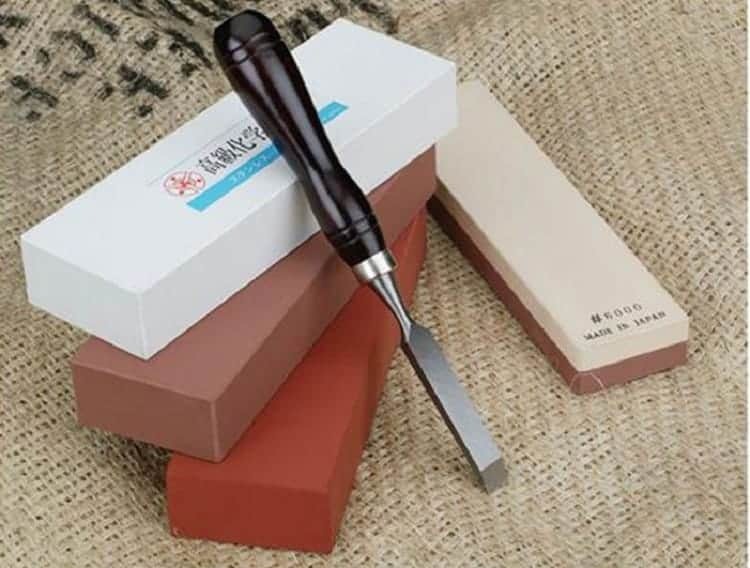 Using the fine grit side of the stone you simply need to move the flat side of the chisel across the surface of the whetstone is a smooth circular motion. Do this across the length of the blade until you are satisfied that any excess grit, metal and defects have been removed. Again, if any burring has occurred during the honing process, use a small block of scrap wood to remove them. And there you have it, a quick and easy guide to sharpening your chisels. Follows those steps and you will have sharp tools ready to use in no time at all. 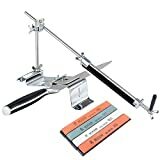 I part two of our chisel sharpening guide we will look into how to use a sharpening wheel with the Tormek sharpening system.